Many of you already know I’m somewhat of a fashionista. Don’t worry you’ll see. If you want to see this gorgeous McQueen look here. just search Craigslist for Alexander McQueen doesn’t matter what city or state & it WILL POP up! Anyway, I want to quickly talk about an item is mine that has garnered a tremendous amount of attention lately. It’s the work of art known as the Alexander McQueen Samsonite Alligator Pullman. I actually own THREE of these beautiful creatures. I bought them late last year after seeing them featured in a charity fashion show. They TURN HEADS. It’s true fashion meets function. 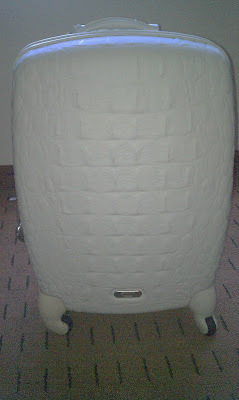 They’re hardside, have the Samsonite spinning wheels for easy maneuvering, and the interiors are also gorgeous. As I said I have THREE of them 2 of which I’ve used a bit & the other I have not. Ping me if you are interested.